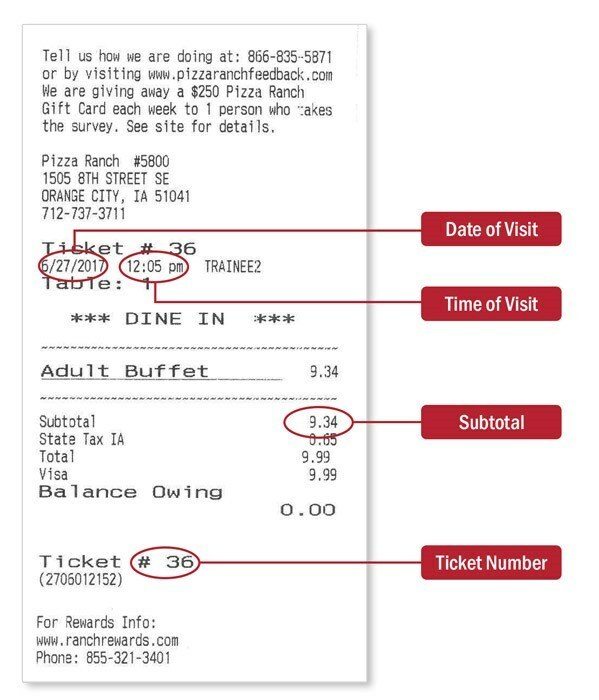 Did you visit your local Pizza Ranch and not receive Ranch Rewards points on your qualified purchase? Please fill out the form, and reference the receipt image below if you have any questions about where to find the requested information on your receipt. We will verify your visit and add points to your account; your account will reflect your new point balance within 2-3 business days, excluding federal holidays. If we have any questions, we will contact you at the phone and/or email address listed below. Please list the best number to reach you at between 8AM - 5PM CST. Please use the email tied to your Ranch Rewards account. This is a 16-digit number on the back of your card, or an 8-9 digit virtual account number. City and State of the Pizza Ranch you visited. If you made a gift card purchase, please provide the time of the purchase. This number is between 1-500, found below your total. If you are submitting a gift card purchase, please write N/A. This amount can be found under the dotted line in the Subtotal row.